The Montpelier Section maintains these segments of the Long Trail (LT). Trails and shelters are maintained by adopters. The work of the adopters and the section is coordinated by the Trails and Shelter Committee of the section. Backup is provided by the volunteer coordinator and field programs director, both staff members of the GMC. 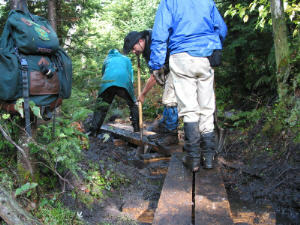 Policy is set by the Trail Management Committee, a volunteer GMC group. Since our trails are entirely within Camels Hump State Park and Mount Mansfield State Forest, the ultimate responsibility lies with the Vermont Department of Forest, Parks, and Recreation (FPR). 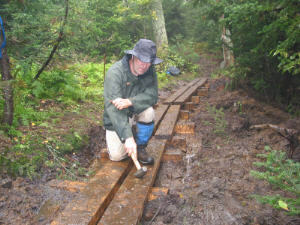 There are always trail maintenance tasks which can be done, individually or in a group. 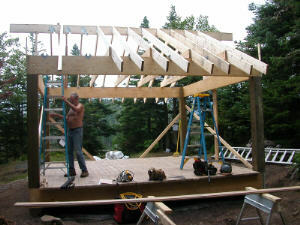 Construction of the Sterling Pond Shelter (2005) is illustrated at right; follow this link for construction history. Construction of the Bamforth Ridge Shelter (2002) and some history is here. Work Hike reports for 2005-2007. Trails and Shelter Committee summary for 2003. Trails and Shelter Committee summary for 2002. Reports of maintenance activities from previous years are kept on another server. The section provides tools for work hikes: shovels, hazel hoes, pick-mattocks, loppers, saws, safety equipment, and a chain saw. However, if you have your own tools, bring them as we may have more workers than expected. Folding saws and hand clips are especially useful. The usual items you would take on any day-long hike to combat rain, heat, cold, bugs, and darkness. Report problems and offer assistance to the Trails and Shelters Coordinator, email trails@gmcmontpelier.org. A description of the Trails and Shelter Committee coordinator's job.